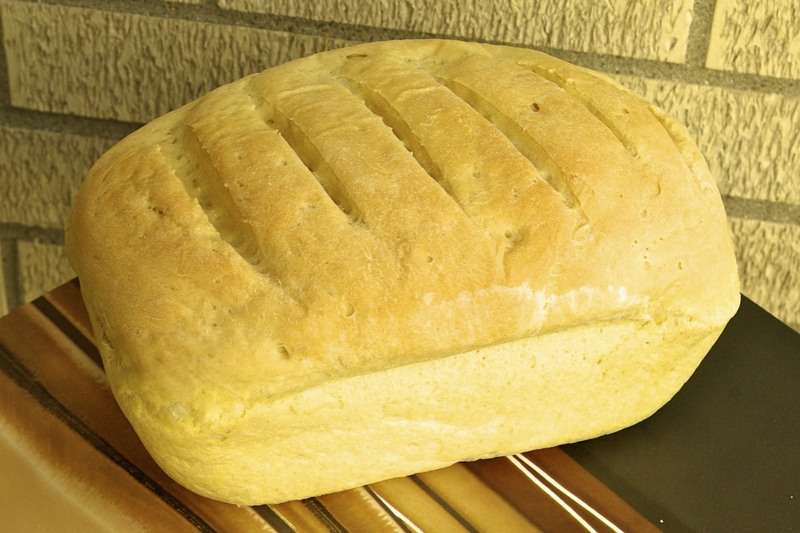 In my opinion, fresh baked bread simply cannot be beat. Whether it is slathered with jam, dipped in a savory soup, or simply delivering your favorite sandwich ingredients to your mouth, a light, chewy, homemade bread is one of the best treats around. The recipe I am sharing with you today is my goto sandwich bread, which I make at least once a week for our lunches. It is ridiculously easy to prepare, and it works well with any meal. A word of warning, however; once you smell the bread baking in the oven, and that incredible warm aroma fills your home, you may never go back to store bought bread again. Like most of my bread recipes, I prepare the dough in my bread machine and then bake it off in the oven. That being said, you can easily make it by hand or in your stand mixer as well. Enjoy! Remember that when you are making breads, the flour to water ratio is often approximate, and can differ slightly depending on the day’s humidity level. If you find your bread dough is too dry, try adding a bit more water, one tablespoon at a time, until you reach your desired consistency. If it is too sticky, add one tablespoon of flour at a time until desired consistency is reached. I also use a scale to measure my flour so that I can ensure consistent results. I have provided the weights of most ingredients below, if you are interested. I highly recommend using bread flour for this recipe, as it yields a fluffier, more chewy loaf. I have made it with all purpose in the past, and while the taste is good, it is often more crumbly and doesn’t seem to stay fresh as long. Water, oil, sugar, salt, flour. Make a small well in your flour and pour the yeast in the hole; be sure it does not touch the water. Set machine for the dough setting and press start. Walk away and do something fun! Once your dough is prepared, lightly flour your work surface and knead the dough a few times, releasing any air bubbles. Flatten the dough into a long rectangle, and starting from one of the short ends, tightly roll the dough into a compact loaf. *Most recipes state that the rise time takes close to an hour…HOWEVER, I find my bread rises in about 30-35 minutes. Be sure to keep an eye on your loaf the first few times you make the recipe, so it doesn’t go too far. Once dough has doubled in size, place the pan in the center of your oven and bake for 25-30 (my perfect time is 28) minutes; you will know it is done when the bread is golden brown, it sounds hollow when you knock on the top, and your kitchen smells AMAZING. *You may need to run a knife around the edges first to release any stuck edges.